The left sheet was folded by me, and the right sheet was folded by my husband. I present to you Exhibit A. And, no, there is no exhibit B. On the left, you see the fitted sheet I folded, and on the right, you see the fitted sheet my husband folded. For over 40 years now, I have yet to hone my skill of folding fitted sheets. Clearly, my husband’s skill-set is above mine, as his end result is quite neat. Though I will no doubt come across as sexist, I challenge all the men reading this post to take a moment and try their skill at folding fitted sheets. Married men, please consult with your wife on which sheet is the fitted sheet; and single men, please call your Mom and ask her. I am sure all the Moms in the world would love to receive a call from her son(s), anyway. Oh, and please, if you call your Mom, let her know I suggested you call. I try hard to get on the good side of Moms. 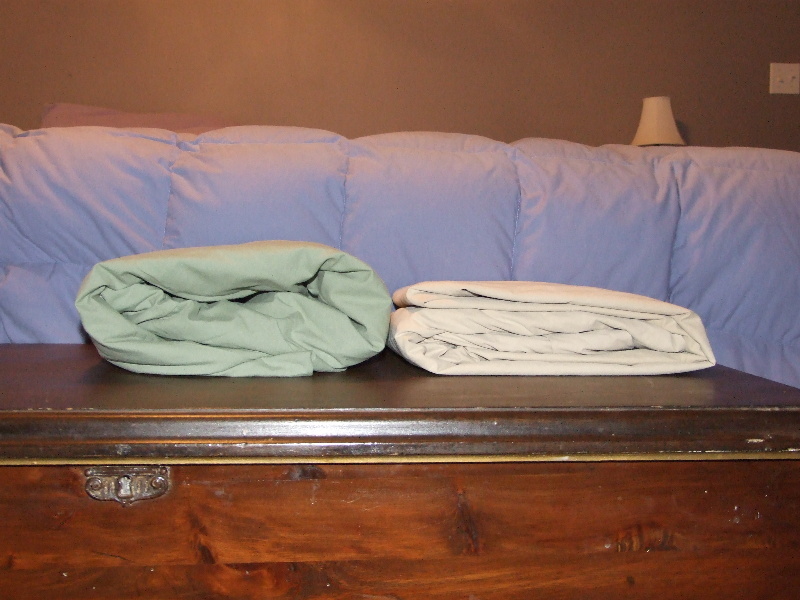 Folding fitted sheets neatly is not something I do well – do good? Argh, is it do well or do good? My use of grammar is not always done – um, I’m not always correct in my usage of grammar. Perhaps my mother will read this post and call me with the proper usage of ‘well’ and ‘good’. But, you will not find me waiting by the phone for my Mum to call, because my Mum, like me, doesn’t like the phone. This is not a post about phones, so I apologize for the digression. For the record, I referenced my Webster’s dictionary and found that I do not fold fitted sheets well, but I do have good hands. I have already showed you pictures of our closets, so you are well aware of my lack of organizational skills. Though I lean more towards the insecure side, it does not prevent me from exposing my faults. In fact, one might say, okay – many would say, over-sharing is something I do well. Talking is another thing I do well, provided ‘do well’ means ‘often talks’. I listen well, too; even though I may ignore what I’ve been told or overheard. I am not a good silent reader, in part because I am easily distracted by sounds and miscellaneous and impromptu thoughts in my head. I do well when reading aloud to my boys, provided I am not reading Dr. Seuss. Dr. Seuss proves to be quite a challenging read-aloud. Actually, I find reading aloud A. A. Milne challenging, too. I am good at Jumbles. Frankly, I’m good at many word games. I love word games, too. I’m not good at number games. Sudoku is not my friend. I believe word problems are evil. I do not enjoy reading about Farmer John, who is driving his tractor 7 miles an hour, while wearing his size 36″ waist purple pants on the 2nd Tuesday of the month. When Farmer John gets to his brother’s house, which is 3 miles from where he went to school 20yrs ago, and the total number of times his 13″ diameter tractor wheels rotated completely during his journey, is of no use to me. I suppose getting a triple word score and a double letter score with a great word in a game of Scrabble is of no true importance to me, either. Still, I’ll always pick a word game over Farmer John and Sudoku. Aside from sharing the fact that I don’t fold fitted sheets well and my husband does fold fitted sheets well, I’m not sure I know what the purpose is of this post. Staying on target, following one train of thought and generally making sense is not on my list of things I do well; however, the ability to cause people to scratch their head and look confused is something I do quite well.